A concerted outcry over homelessness in the 1960s wasn’t meant to echo so loudly through the decades. When the founders of Crisis at Christmas began their campaign, the Beatles were still together and no-one had yet landed on the moon. They intended their appeal, in response to an emergency situation in London, to lead to a rapid, lasting solution. Fifty years on, the crisis has not been solved. For Crisis, the organisation still bearing that urgency in its name, marking half a century of work could hardly be a celebration. But it could be a time to reflect, regroup and renew its determination to end homelessness. Neo was commissioned by Crisis to find a key idea around which the brand could rally. We listened to the stories, of those who use their services, those who give up their time to volunteer and those who work there. We considered the crowded landscape around action on homelessness, where it can be difficult to understand who’s who and does what. And we explored Crisis’ heritage and its plans to define an ambitious, collaborative way for ending homelessness in the UK. We found an organisation that faces homelessness every day, and knows it deeply, from the experience of the individual through to the big strategic picture. A charity with an entrepreneurial spirit, determined to bring together whoever and whatever is required to deal with it. The process of clarifying Crisis’ unique role laid the foundation for a new strapline: Together we will end homelessness. 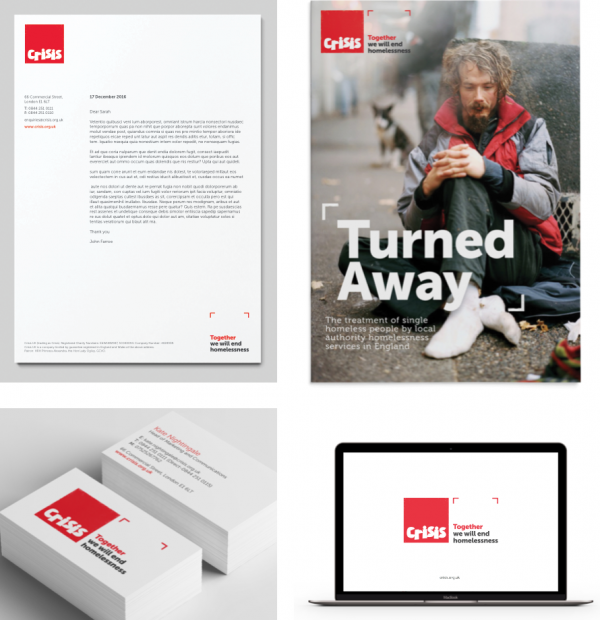 Then in parallel with the reinvention of their digital presence, we worked with the Crisis team to bring the visual and the verbal brand into the right space. Guiding a new photographic style, we brought the focus to eye level, increasing the sense of being equal to the people they help and work with; not looking in, or looking down. By opening a window into the world of homeless people, the imagery seeks to evoke empathy, rather than sympathy, in Crisis’ audiences. We found a new approach to framing the Crisis logo, better reflecting the qualities of expertise and knowledge. This provided a device offering continuity across many distinct activities and sub-identities – such as the core services, the research output, the cafes, and the all-important Christmas appeal. And we shaped a consistent, accessible way to talk about Crisis’ work, through a tone-of-voice and key messaging framework. Crisis are now in the process of bringing together the big picture, showing how its people and many partners can achieve the seismic change they believe is possible. 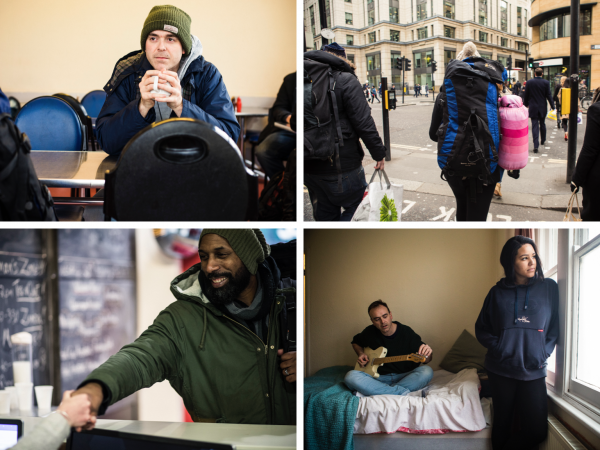 We’re excited to see how their renewed sense of purpose and a clearer, more connected identity enables them to build the momentum and the movement that can put an end to homelessness.